190cm x 90cm x 17cm approx. 3ft Luxury. This is a luxury pink budget mattress. Budget Range Mattress. 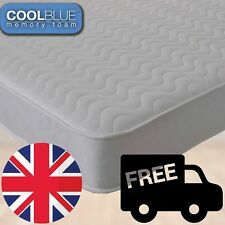 This is one up from a basic mattress and is suitable for all bed types. This does not affect your statutory rights. 190cm x 90cm x 17cm. Brought to you by Capital Beds, the Patrick is a bright, colourful and unisex kids spring mattress forming part of our luxury budget range. The 3ft Luxury Budget Patrick Mattress. 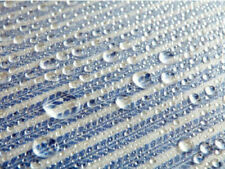 The waterproof mattress is vital inclusion in the caravan mattress range. 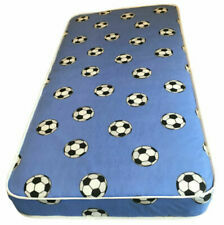 This mattress is ideal for children as this mattress is waterproof on both sides. Mattress Features Perfect for a first mattress. childrens bunk beds with mattress. Condition is Used. Has been assembled twice after moving properties and has a split in one of the side panels, but no issues reassembling. Has a few threads hanging and has always been used with mattress protector. THE NAME OF YOUR CHILD ON THE BED !!! Two sizes 140x70 160x80! Optional drawer! 6 colours !!! 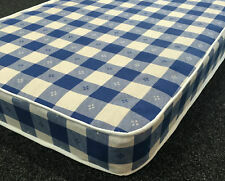 Deep Quilt Sprung Mattress waterproof. Deep Quilt Sprung Mattress Features • Reversible mattress. • 12.5 gauge Bonnell spring system with side support. See below for details. IKEA SNIGLAR toddler children's bed frame with slatted bed base. Underlig mattress included (excellent condition). Used but in excellent condition. Frame is sold as built. Collection only. IKEA EXTENDING BED WITH 3 PART MATTRESS VERY LITTLE USED. THE MATTRESS IS 80 CM. WIDE AND 200 CM. THERE ARE FEW LITTLE KNOCKS ON ONE OF THE LEGS BUT MATTRESS AND COVER IS VERY CLEAN. A LOVELY SOLID PINE WOODEN BED THAT CAN BE EXTEND FROM 143 CM.TO 200 CM.